The liturgical arts are important; this is our belief. This belief is not merely our own here on LAJ however, it is rather one that is formed and affirmed by the Church herself, testified to by her guidance and legislation around the same. This activity on the part of the Church is suggestive of the fact that these are not matters without importance; they are not trite matters of inconsequence, nor are they shallow aesthetic enterprises. Worthy vestments are not mere "fashion," nor is noble liturgical music or worthy architecture mere decor -- though they may well be said to be matters of decorum. 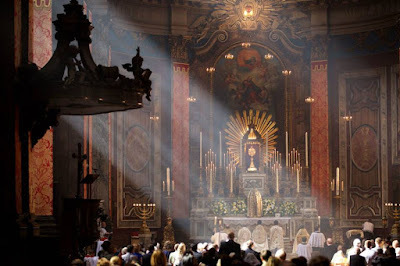 All of these manifestations of beauty within the sacred liturgy are far more substantive than this, acting as "messengers" and as a gateway to the divine, impressing the sacred realities upon us, and also acting as a form of offering in their own right; an offering to Almighty God. ...one enters the Church by two doors: the door of the intelligence and the door of beauty. The narrow door... is that of intelligence; it is open to intellectuals and scholars. The wider door is that of beauty... The Church in her impenetrable mystery as the bride of Christ, the Kyrios of Glory, has need of an earthly epiphany (ie. manifestation) accessible to all: this is the majesty of her temples, the splendour of her liturgy and the sweetness of her chants. Take a group of Japanese tourists visiting Notre Dame Cathedral in Paris. They look at the height of the stained-glass windows, the harmony of the proportions. Suppose that at that moment, sacred ministers dressed in orphried velvet copes enter in process for solemn Vespers. The visitors watch in silence; they are entranced: beauty has opened its doors to them. Now the Summa Theologica of St. Thomas Aquinas and Notre Dame in Paris are products of the same era. They say the same thing. But who among the visitors has read the Summa of St. Thomas? The same phenomenon is found at all levels. The tourists who visit the Acropolis in Athens are confronted with a civilisation of beauty. But who among them can understand Aristotle? And so it is with the beauty of the liturgy. More than anything else it deserves to be called the splendour of the truth. It opens to the small and the great alike the treasures of its magnificence: the beauty of psalmody, sacred chants and texts, candles, harmony of movement and dignity of bearing. With sovereign art the liturgy exercises a truly seductive influence on souls, who it touches directly, even before the spirit perceives its influence. The whole priestly influence is exercised on the members of the Church only by means of sensible, authentic forms, which are its vehicle. 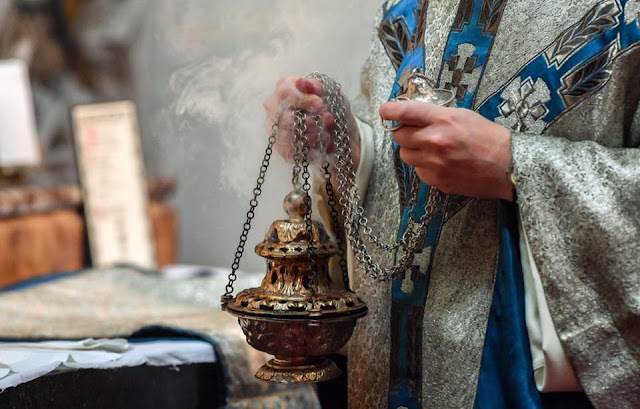 Formulas, readings, chants, rites, material elements, in short, all the externals of the Liturgy, are indispensable for sharing in the thoughts, the teachings, the acts of adoration, the sentiments, the graces which Christ and His visible priesthood destine for us. Hence, to minimize this visible contact under the pretext that the soul can then better achieve something interior, or that invisible communion suffices, is at the same time to diminish the priestly influence of the hierarchy and consequently the action of Christ in our souls. Pope Benedict XVI, in his homily at the great basilica of Antonio Gaudi, La Sagrada Familia, continues this theme when commented that "...beauty is one of mankind's greatest needs; it is the root from which the branches of our peace and the fruits of our hope come forth. Beauty also reveals God because, like Him, a work of beauty is pure gratuity; it calls us to freedom and draws us away from selfishness." This recognition of the importance of beauty within the sacred liturgy and liturgical arts should bring with it a concurrent concern for those manifestations which may arguably be deficient in beauty and nobility -- though, admittedly, where that line might fall in practice is no simple matter to define; our focus today, however, is simply on the principle of the matter. By contrast, the temptation in our time is to write these off as "non-essentials" -- though this really amounts to little more than a form of theological virtue-signalling by which the person purports to transcend such 'accidentals,' in effect moralizing on the matter and implying their own superiority and 'maturity' in the process. This separation of the substantial and the accidental sounds good in theory of course, but the reality of our incarnate nature is a bit more complex. This brings us back to the points raised by Calvet, Beauduin and Benedict XVI about the importance of beauty for all -- and that is a fundamental truth missed in this mistaken attempt to place a wedge between unseen theological realities and the liturgical rites and arts they often come clothed in. Indeed, if beauty "opens to the small and the great alike" and "exercises a truly seductive influence on souls", if it is an "epiphany," -- all things that our human experience point to -- then what should be our concern if this should be found lacking or deficient in some way? What message and what influence might that effect? Should we not therefore treat these matters with some earnestness? It is my firm belief that the answer to this question must be an unambiguous 'yes.' We must not shy away from the pursuit of liturgical beauty. Rather we must make bold, confident in the assurance that the Church herself gives us about its importance.